This is my ALL TIME favorite spaghetti recipe! Side note: I was definitely going to name this post “mom’s spaghetti,” but then I realized that since I was middle school in the early 2000’s and that phrase will always be associated with Eminem’s “Lose Yourself.” So I refrained. Anyway, today I’m sharing my mom’s homemade spaghetti with meat sauce. My mom is one of the best cooks I know, and her spaghetti is one of my favorite meals of all time. Seriously, I requested it for my birthday meal more than once. All the ingredients, laid out together – sort of for blogging pictures, but more so because it keeps me from forgetting steps. Brown the ground beef (or turkey, whichever you prefer). Drain the excess fat (I leave a tiny bit to grease the onion’s cooking), then add in onion. After the onions have had a minute or two’s head start, add in garlic. All the tomato-based ingredients. I like to use canned whole tomatoes instead of chopping because I think they have more intense flavor, but it’s most likely because that’s how my mom does it so I continue the tradition. Adding most of the spices are my additions to mom’s recipe. I usually just eyeball it, so feel free to do what tastes good! After its cooked for several hours, everything melds together nicely. You may need to crush the last chunks of whole tomatoes with your spatula, but they should be soft and easy to stir the last bits in. There it is! It’s easy to make and freezes well, so I try to always have a batch in my freezer. The recipe makes enough for a crowd (maybe 8-10? ), so I can usually freeze half every time I make it. Brown beef. Drain excess fat, but leave a little. Add onion, cook until a couple minutes. Add garlic and cook for another minute or two, until onion is clear. Add everything else, and cook on low for hours. 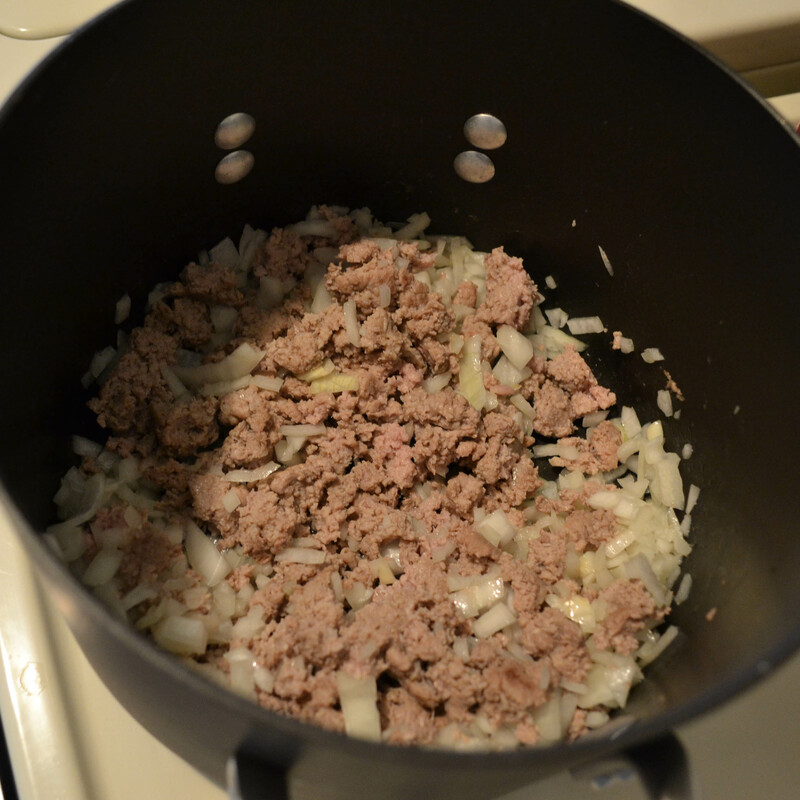 *= Mom uses ground beef, but I switched to ground turkey – it’s both cheaper and healthier. Some people can taste a difference, but in a recipe that’s so flavorful, I can’t. That’s it! Super easy. And oh so good!